If Belfast played by Westminster rules, Arlene Foster would already be out the door. Northern Ireland’s First Minister is embroiled in one of the worst – and clearest cut – examples of ministerial bungling seen anywhere on these isles in at least 50 years. The Renewable Heat Incentive, launched in 2012 while Foster served as enterprise minister, was a cut-down version of British scheme to subsidise non-domestic customers – farms and businesses – in switching from oil to wooden pellet-burning biomass boilers instead. ‘Burn to earn,’ or ‘cash for ash,’ meant recipients could claw back £160 for every £100 of fuel used and has led to a potential £400m overspend. That’s a conservative estimate. It’s perhaps worth pointing out that Northern Ireland only has 1.8 million inhabitants – a population around the size of Hampshire. It’s the equivalent of a UK Business Secretary messing-up a scheme that saddled UK taxpayers with liabilities running into the tens of billions. So a classic case of the minister in charge needing to quit? You would think, given our longstanding British traditions of ministerial accountability. But they should. Foster is not a bad politician in the main, and certainly a welcome successor to Peter Robinson and before him Ian Paisley. She has done a decent, if not spectacular job since she took over 12 months ago. The trouble is Foster is bang to rights over RHI. The sheer scale of the mistake means there is no wiggle room: She should resign. 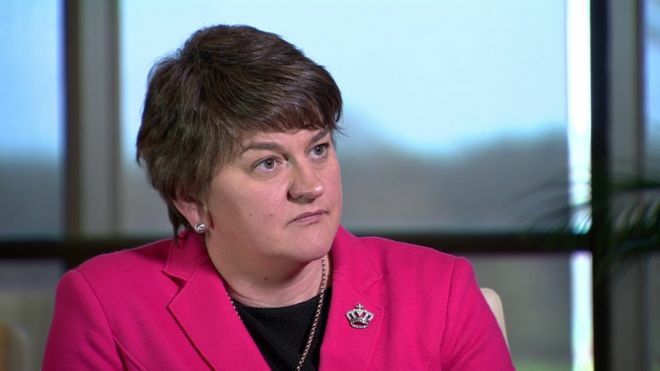 If she stays, and the assembly collapses as a result, precipitating fresh elections, it is DUP candidates who will find themselves trying to explain this mess on the doorsteps, with their Ulster Unionist rival breathing down their necks. But Foster is nothing if not defiant. In interviews earlier this week she insisted that the whole row is down to her gender, claiming her critics are ‘misogynistic’. Yet this saga only came to light after her successor as enterprise minister, Jonathan Bell – one of her own – blew the whistle in December. Sinn Fein, keen to avoid the disruption of Foster being forced out, has not pressed its advantage. Instead, the Shinners have been urging her to step aside while an inquiry establishes the facts. Foster’s response has been one of dunder-headed defiance. She has broken the arch lesson of dealing with a political crisis: She has turned her handling of the problem into its very own crisis. Before the Christmas break, she was forced to explain herself to the Northern Ireland Assembly. In rambling, indulgent and largely incoherent speech (after all the other parties had walked out in protest) Foster conceded there needs to be some sort of investigation – a point she was hitherto loath to admit when this scandal was gathering pace. Now, at the eleventh hour, she claims to have a rescue plan to curtail the scheme and limit costs. But as Jim Allister, the leader of the hardline Traditional Unionist Voice party reasonably points out, cancelling the scheme and clawing back payments is potentially a litigation minefield, with recipients of the grant suing the executive for breach of contract. Her inept handling of this crisis means Arlene Foster is inching towards the exit door. For her own dignity, it would be better if the DUP’s men (or indeed women) in grey suits were to visit her and get her to fall on her sword and avert fresh elections and the attendant disruption. Ultimately, this mess is a test of the maturity of Northern Ireland’s political structure and whether the system can lose Foster without broader fallout. It can. And it should. Kevin must have a personal interest in bringing down Foster. Wonder if he has republican sympathies! The real problem is the whole Global Warming lunacy. Burning an ecological asset instead of ready-made fuel, because of a moronic fear of the life-giving CO2, is indicative of the ‘dark age’ thinking of an insane religious cult. Ah, the old insane religious cult problem – that’ll be what most of us call “science”.